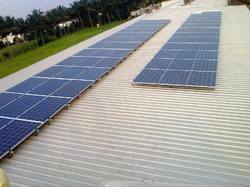 Our product range includes a wide range of roof top solar power plants. Marked at the most reasonable rate possible, the range of RooftopSolar Panel made by Jaisun solar. we make Jaisun Solar Panels are made by Q-cells. we have intelligent integration technology for better efficiency and good reliablity of roof top plants. Looking for Rooftop Solar Panel ?